My most favorite festive season is here and nothing beats the warm baking aroma that whiffs through my home on a cold winter morning! 🙂 Wishing all my dear readers who are celebrating, a blessed Christmas and happy holidays! I have been baking away a good part of the morning and our Christmas breakfast menu included gooey cinnamon rolls, savory muffins with peas and corn, smoked barbeque sausages and stuffed omelette. I enjoyed baking this particular cinnamon rolls recipe that I have adapted from the Pioneer Woman’s food blog. 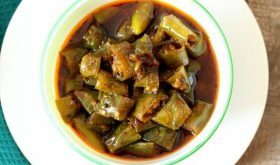 What I love about this recipe is its simplicity, it is eggless, requires only one rise and unbelievably delicious. 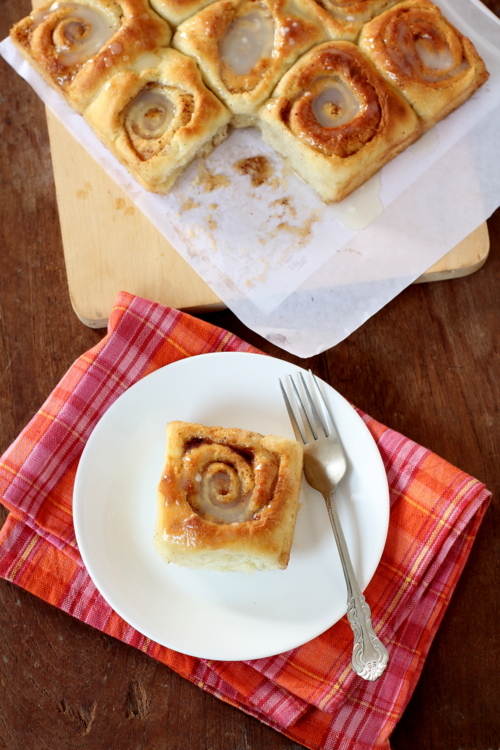 Warm, fluffy, gooey and super soft buns bursting with aromatic cinnamon flavor! This ultimate Christmas breakfast did not take me long to bring together as it does not require a lot of preparation. 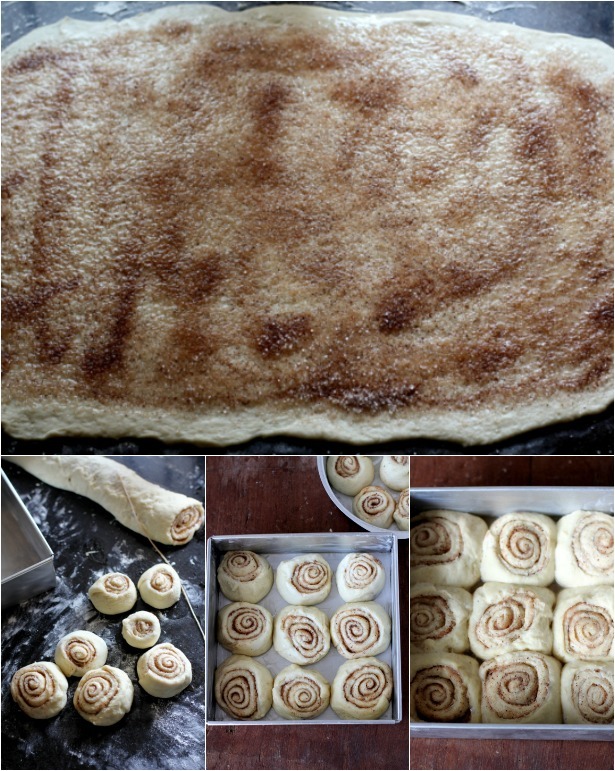 The dough/rolls can be made in advance and refrigerated overnight so that its a breeze to bake the next day morning. Do use a string or dental floss to cut the rolls. You can increase the amount of sugar in your filling to 1 cup if you like your rolls on the sweeter side. The next time I bake them, I will use brown sugar for the filling and flavor the glaze with coffee. Do try this perfect holiday breakfast that is sure to win the hearts of your family and friends. In a large wide stainless steel bowl, add milk, oil and sugar and heat on medium flame for 2 to 3 mts till hot on touch. Turn off flame and allow to cool to luke warm. Sprinkle yeast over this milk mixture and allow to sit for 2 mts. Add 4 cups of flour to the yeast mixture bowl and stir until just combined and cover with a kitchen towel. Set aside in a warm area of your kitchen for at least an hour. After one hour, remove the kitchen towel and add the baking powder, baking soda, salt, and the remaining 1/2 cup flour. Mix thoroughly and and add a little more flour if necessary. Now the dough is ready to prepare rolls. Preheat the oven to 190 C. To prepare the rolls, dust your work surface with a generous amount of flour and roll the dough into a large thick rectangle, approx 30" X10" in size. Refer the picture above. To prepare the filling, pour 3/4 cup of melted butter over the surface of the dough and use your fingers to smear the butter all over. Sprinkle cinnamon powder all over followed by 3/4 cup of sugar. Now, slowly roll the rectangle tightly towards you using both hands. Roll tight and its alright if the filling oozes. Pinch the ends of the log. Use a string or dental floss to cut 1 1/2" slices off the log. Grease a round or square cake pan and place the slices, being careful not to overcrowd since they will rise. Cover with a kitchen cloth and allow to sit for 20 mts. Remove the kitchen towel and bake the rolls for 15 to 18 mts or until golden brown. Do not over brown them. While the rolls are baking, make the icing. In a bowl, add the powdered sugar, vanilla extract and milk and mix together until smooth. You may replace the milk with cream or coffee. For a thicker glaze, you can add more powdered sugar. Once the rolls have baked, remove the pan from the oven and immediately drizzle icing over the top and all around the edges. Serve warm. After Step 4, you can use the dough right away, or refrigerate for up to 2-3 days, punching down the dough if it rises to the top of the bowl. You can use skimmed milk or whole milk to prepare dough. 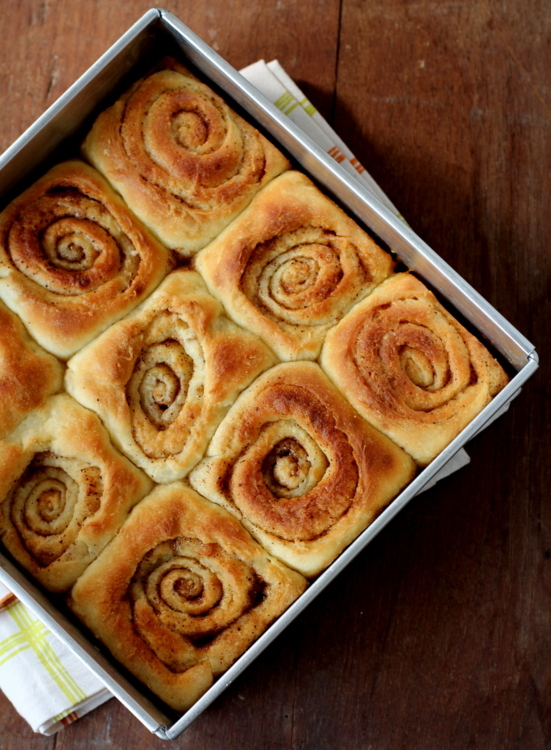 Just before serving, drizzle the cinnamon rolls with glaze. String or dental floss works best to cut the rolls into smooth slices. I have used an 8" round cake pan and 8"X8" square cake pan. By Sailu Published: December 25, 2013 Learn how to make Cinnamon rolls recipe with yeast. 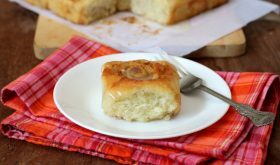 For Christmas breakfast, I baked an easy to make eggless cinnamon roll recipe that is soft and tasty. Is it possible to store it? If yes, for how many days? Cinnamon rolls stay fresh at room temperature for 2 to 3 days. Take care to wrap in foil or plastic wrap. You can refrigerate upto a week wrapped in foil or plastic. Or freeze for a couple of weeks. Lovely :))) Thanks a bunch!! You are my favorite and I have been following your recipes for cakes, cookies n everything else that you make :))) Merry Christmas!! You will find most baking ingredients in VK’s Chocolate store which is opposite HSBC building in Siripuram. Lovely recipe..thx..i tried and it becomes just perfect ..where i can find ur more recipes?? Lovely cinnamon buns. so love chewing on them. Merry Christmas to you too Sailu. One doesn’t have to knead the dough…just mix it ? Yes. No need to knead. Wow! I love everything with cinnamon! I will definitely try this one out. Thanks! hi sailu, love this recipe.from where can i get yeast…?? You should find it in the major departmental stores in your city. Ask for active dry yeast. Hi sailu.. I ama regular follower of your blog. I have tried many of your recipes and they come out really well. Seeing array of baked items. Im also inspired to bake. Canyoupl. Share your oven details along with your experience to help me further thanking you in advance. I use an OTG (Oven-Toaster-Grill) for all my baking and the brand is Murphy Richards. For a small family or beginner baker 18 lts oven will do. For dvanced bakers and who bake larger quantities 40 lts is ideal. I tried it. Was delicious. Skipped the yeast, so the rolls turned out to be harder than anticipated. But yay. Thanks to you, I finally made this recipe!! Can I mix in the baking powder and baking soda with the yeast and flour in the beginning? Is there a reason it was done thst way?